In honor of National Child Passenger Safety Month, have you taken the pledge to Buckle Up for Safety? If not, I highly recommend that you do so as it is just a simple click away. 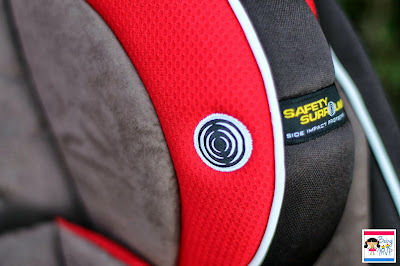 To celebrate this special month, I was sent the Head Wise™ 70 Car Seat with Safety Surround™ Protection for review from Graco. I decided to install it in my mother-in-law's SUV because she picks Kenzie up from preschool. When I pulled the Graco car seat out of the box, I was surprised that it was not heavy at all (compared to the large shipping box). The Lowell fabric features rich chocolate and red tones that are perfectly neutral. 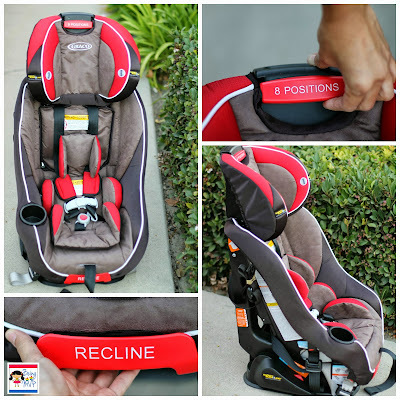 You can use this convertible car seat rear-facing for infants and toddlers 4-40 lbs and forward-facing for toddlers 20-70 lbs. Kenzie is 30 lbs but has been forward facing so I decided to install the seat this way as not to completely disorient her although technically she would be safe rear-facing in this seat. 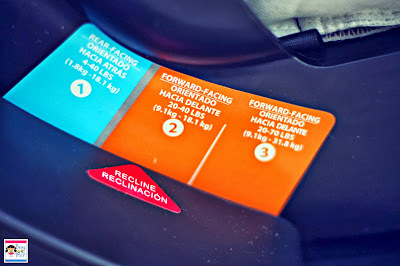 There are 3 recline positions that can easily be adjusted with a pull of the red handle near the bottom of the seat. You can easily tell which position you are in by checking the handy chart on the side of the base. I decided to put the seat in on the 2nd position so as to avoid the floppy head that Kenzie tends to get while napping in the car. It's also a comfier ride for young tots, in my opinion. Next, I had Kenzie sit in the seat and pulled up on the red handle marked "8 positions" to adjust the headrest. This also, in turn, automatically adjusts the harness. This amazing Simply Safe Adjust™ harness system means no re-threading - - ever! I was really surprised to see how high the headrest truly goes and although I'm sure Kenzie will outgrow the seat by age rather than height, it's a fabulous option for those with meatier tots i.e. my meaty before he started thinning out. Graco's Safety Surround™ Side Impact Protection is the only side impact protection properly positioned to protect your growing infant. This follows Kenzie's head whenever adjusted! Now onto the installation of the Graco Head Wise™ 70 Car Seat. 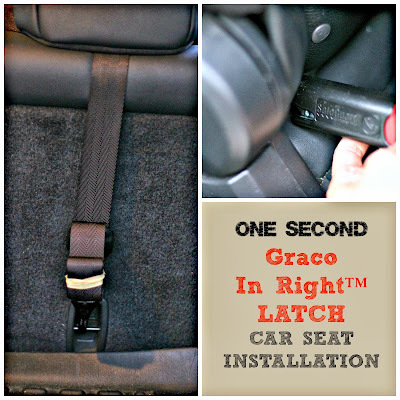 When I read in the manual that Graco's In Right™ LATCH system takes one second to install, I was a bit wary. However, when I actually unclipped the LATCH and found the connectors in the car, it really did take 1 second to clip in and pull tight. Perhaps it did help that my in law's vehicle had connectors that were almost visible without having to dig into the deep recess of the seat as in my car. You then pull the strap to secure the seat behind the headrest and clip onto the bar. Super simple and done in no time. Kenzie was ready to take a ride and climbed right in. 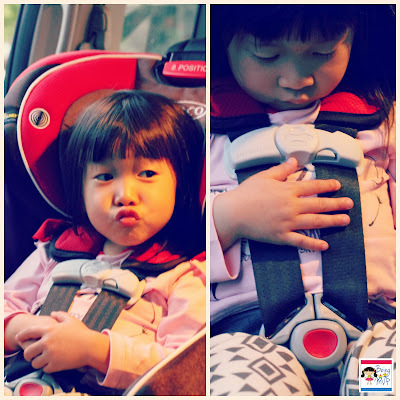 The five-point front adjust harness will keep her safe. The clip takes a bit of getting used to however once you figure out how to unclip, it takes mere seconds. 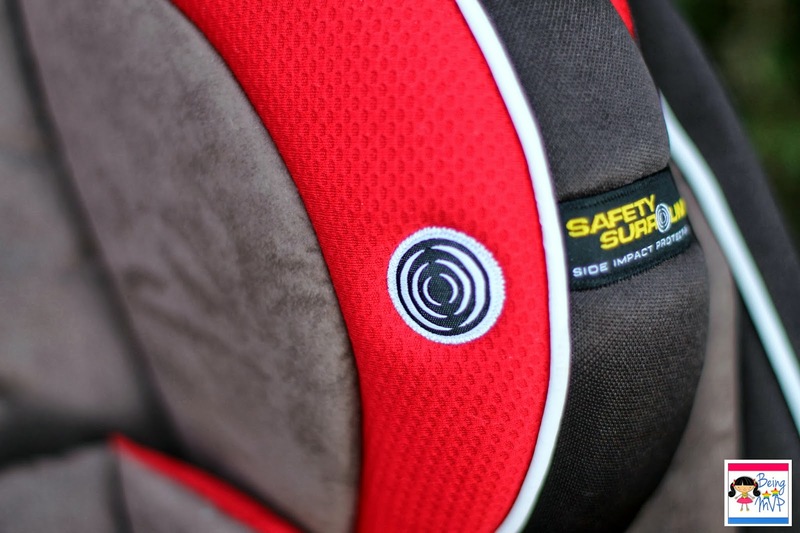 The seat cushion and inserts are machine washable which is great when you let your child eat in their car seats as I do. The buckle can be cleaned with a baby wipe or damp cloth. Kenzie loves her new Graco Head Wise™ 70 Car Seat with Safety Surround™ Protection and I am happy to report that my mother in law is keeping her safe while driving the princess around. 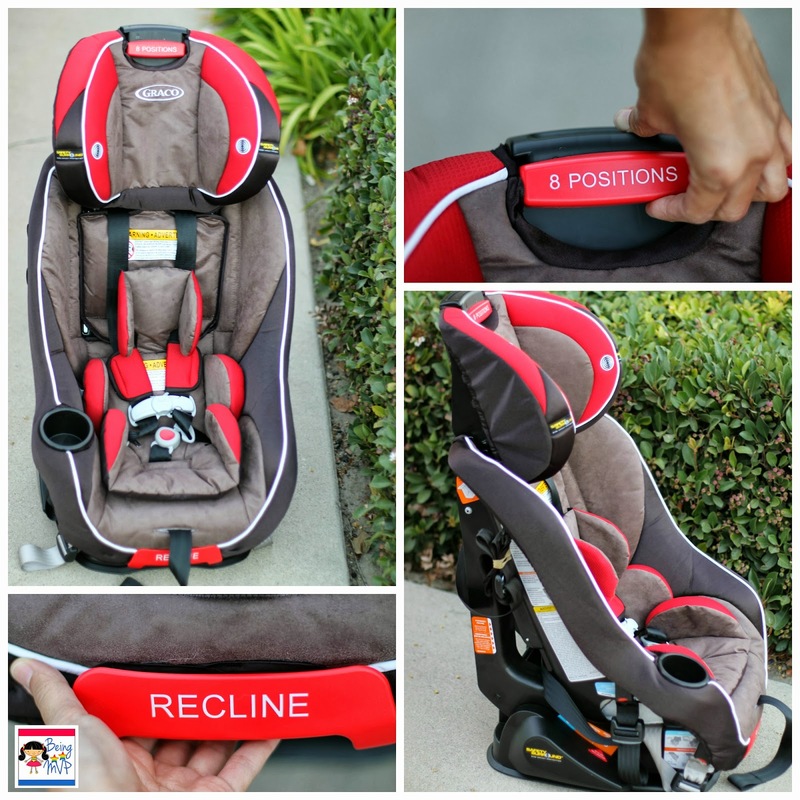 Buy It: You can purchase the Graco Head Wise™ 70 Car Seat with Safety Surround™ Protection for $199.99. Make sure to connect with Graco on Facebook and Twitter! The adjustable headrest is a great feature to have. And I like that with the adjusting of the headrest, it also adjusts the harness. The side impact protection is a definite must! Sounds like an excellent, all-around car seat. So glad they are finally making car seat that actually change with your child. When mine were little we went through 3 or 4 different car seats before they were done with them. Awesome how they have made sure they are safe in every different stage. I am interested in this seat and it looks really nice. I like the features and it looks like a really comfortable seat. This looks like such a safe seat for my grandson. I love the built in cup holder, too! The fabric looks soft! This looks like such a protective carseat. I love the built in cupholder. so nice! i will recommend this to my pregnant niece! I love how protective this car seat is. Thanks for sharing. Graco is definitely a brand that I trust. 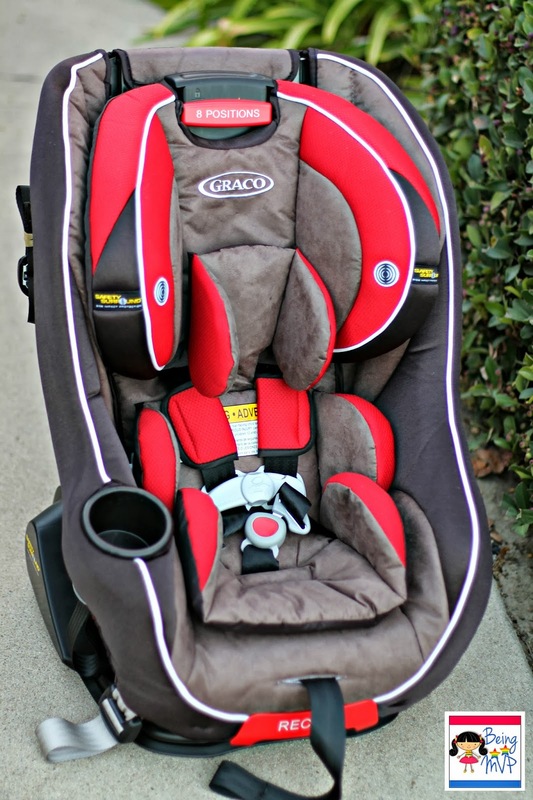 It is nice to see such a luxurious carseat from Graco. This looks like a great seat. Looks like you can rear face a child for a while.